CBAC Forecaster's Blog: Tech Tip: Did Your Compression Test Just POP or DROP? Tech Tip: Did Your Compression Test Just POP or DROP? Recent research in the snow and avalanche world is showing that how a compression test fails is just as or more important than the number of taps it takes for it to fail. Researchers have come up with a classification system to qualify and describe fractures in snowpack tests. This system is known as Fracture Character. Fracture Character does not necessarily replace Shear Quality—or the “Q scale.” It compliments it, and can even provide a bit more information about the relationship of the weak layer and the overlying slab. It breaks fracture type into 2 main categories—sudden fractures and non sudden fractures. This post will solely deal with sudden fractures. Sudden fractures are what avalanche practitioners call “pops” and “drops” in snowpack tests. If the fracture is a pop, a thin crack will cross the column of snow with one loading step (or tap) and the block will slide off the weak layer easily. It could be your 5th tap or your 20th—the key is that one tap initiates a crack that crosses the entire snowpack column. This may not be as obvious as the old analogy of “it shot out like a cash register drawer.” On lower angle slopes you may have to grab the block and give it a slight tug. If it slides off without much effort you are still dealing with a pop. If it is a drop there will be an observable (and sometimes audible) collapse on the weak layer that occurs with one loading step, or tap. If you flip over the block it may not necessarily be smooth. Drops in depth hoar will commonly look rough when you examine the fracture. Why is this important? Researchers have correlated sudden fractures with skier triggering avalanches. 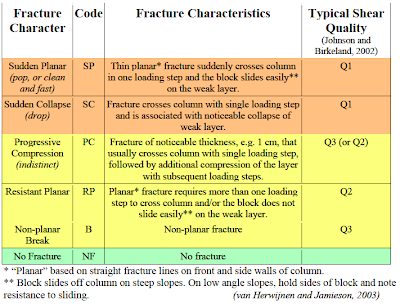 Recent studies have shown that “Fracture Character is a valuable addition to the compression test score since most failure layers of slab avalanches produce sudden fractures in compression tests” (van Herwijnen and Jamieson 2004a). Paying attention to whether your compression test “pops” or “drops” can give you a better indication of whether or not a specific slope has the potential to avalanche. This is also great information to include when you send in your observations to the CBAC. Remember that performing snowpack tests is just one part assessing the snowpack. No one test can tell you if a slope is stable. If you want more information on this topic check out Alec van Herwijnen and Bruce Jamieson’s 2004 paper titled Fracture Character in Compression Tests. 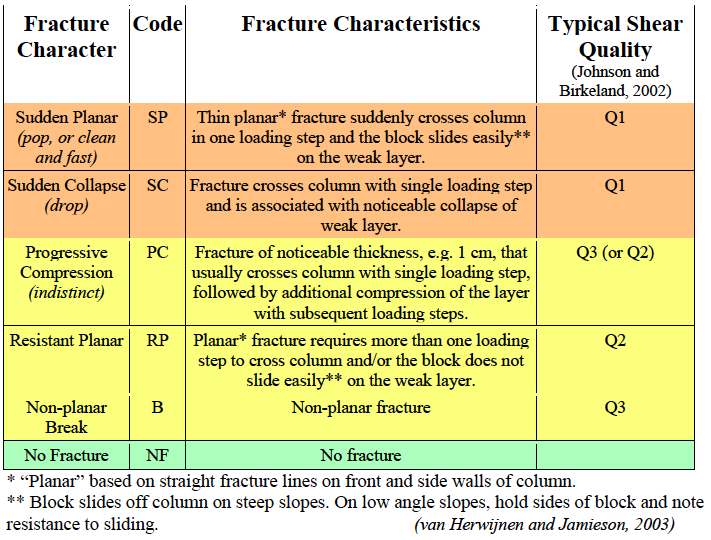 The chart below compares Fracture Character with shear quality and provides definitions for Fracture Character. to Improve Stability Test Interpretation." TAR Vol. 23. No. 2: 2004. News 66. Canadian Avalanche Association, Revelstoke, BC, 26-28.
van Herwijnen and Jamieson 2004. Fracture Character in Compression Tests. ISSW 2004.
van Herwijnen and Jamieson 2004a. Fracture Character in Compression Tests." ISSW 2004.